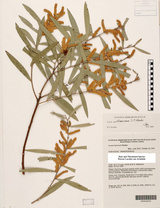 Description: Spreading shrub to erect tree 2–8 m high; bark fissured and flaky, grey to dark grey-brown; branchlets angled, flattened to ellipsoid in section, glabrous. Phyllodes dimorphic, usually oblanceolate to narrowly elliptic, rarely slightly curved, 4.5–12 cm long, 4–11 mm wide, pale green to subglaucous, glabrous or rarely pilose and glabrescent, longitudinal veins numerous, closely spaced, non-anastomosing, 3–5 more prominent, 4–8 veins per mm, apex acute with a mucro, sometimes with an obscure gland at base; pulvinus 0.5–3 mm long; phyllodes on young growth shorter and broader, ± obovate. Inflorescences 2 on an inconspicuous axillary axis to 1 mm long; heads cylindrical, 1.5–4 cm long, pale yellow, ± sessile. 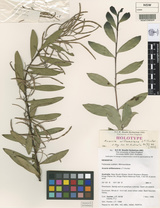 Pods curved, ± flat, slightly raised over and ± constricted between seeds, 3.5–9 cm long, 2–4 mm wide, firmly papery to thinly leathery, finely longitudinally wrinkled when dry, mostly glabrous (often with sparse minute hairs at base and apex), slightly pruinose at least when young; seeds longitudinal; funicle filiform, folded 2–3 times, expanding into an aril. Distribution and occurrence: Disjunct populations restricted to the granite ranges of northeastern New South Wales, chiefly northwest of Glen Innes to west of Ashford, including Torrington district, Pindari Dam and McIntyre Falls; rare. Grows in shrubland and low woodland, on and around the base of rocky outcrops. 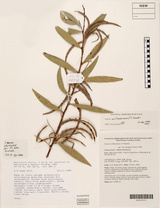 The name honours John Beaumont Williams (1932 - 2005), a botanist, ecologist and teacher whose career was largely associated with New England University, Armidale. He first recognised the distinctiveness of this species.